Their music has been described as "a unique blend of meditative electronic sounds, evocative vocal harmonies and thoughtful lyrical messages" which sums up the approach of Salt Of The Sound pretty well. This Wimbledon-based husband and wife duo have just released their 'Journeys' album. Producer and percussionist Ben Tatlow spoke about his early life and how this most inventive of groups finally came into being. He said, "Being musicians, my parents moved around a lot when I was younger - I think I lived in four or five countries before I could walk! They ended up settling in Stockholm, Sweden, attending a large international church (Immanuel) in the centre of the city. When I was 10 we relocated to the UK, where I have lived since. My family moved back to Sweden a few years later, and it was on school and university holidays in Stockholm where my faith started to become my own, rather than something inherited. I interned at Immanuel Church for a number of summers, working with both the youth ministry and the worship teams, and through the people and the experiences there my walk with Jesus began in earnest. Anita and I met at Nottingham University in 2008 - we were on the same course (music, what else!) - and it was our faith that sparked our first conversations." 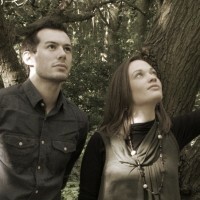 Ben and Anita, who sings and plays piano, originally started talking about making music together in 2010 but as Ben explained, "It took a good few years, engagement and marriage for us to feel that we're in the right situation to be able to share the message that God has placed on our hearts. A theme that exists in our music is that of reflection: our lives are all increasingly dominated by seemingly urgent pieces of information - often the answer can be found in taking a few minutes away and seeking out the presence of God. Many of the songs on the album are reflections on our calling as Christians amidst a hectic yet ultimately comfortable London lifestyle. This has been a real tension for us. Working in fairly typical professional jobs (marketing and teaching) has often stunted both the time and the creative space available to write music - yet it is the musical side of our lives that we feel most called by God to pursue and develop. And we've recently made an exciting decision to move to Sweden in the new year, in large part to focus more on Salt Of The Sound." 'You are the salt of the earth; but if the salt has become tasteless, how can it be made salty again? It is no longer good for anything, except to be thrown out and trampled underfoot by men. You are the light of the world. A city set on a hill cannot be hidden; nor does anyone light a lamp and put it under a basket, but on the lampstand, and it gives light to all who are in the house. . .' As tiny pieces in God's great story, we all have a part to play and this verse is so captivating for me - Jesus is telling us to go out into the world and be that light, be the salt and give flavour to people's lives that they might hear and know. Music: what an incredible and beautiful medium to allow us to achieve this." For the past four years Ben and Anita have served as worship leaders at Hillside Church, Wimbledon, London. Explained Ben, "Hillside is a non-denominational church which aims to be a community where Jesus is discovered, followed and loved, both locally and internationally. Since we arrived at the church, we've been heavily involved in both accompanying and leading worship. Anita is a trained pianist and singer, while I play a combination of drum kit and African percussion. We have been incredibly fortunate to be able to worship alongside some wonderful and talented musicians from all corners of the globe who live and work in South West London, which has helped us grow both spiritually and as worship leaders. As the original music we write is not traditional 'worship' music, we've used it more in times of reflection and meditation, usually during communion or to close a service. The church have been very supportive in us using our music in this way, which has been a real blessing to us. We've found it so encouraging having a community of people who are both aware of and in support of what we're embarking on as Salt Of The Sound." Anita described the creative process that has gone into the haunting compositions on 'Journeys'. "Usually, one of us will start with an idea and I'll sit at the piano and try to piece together the song lyrically, with some kind of hook for the refrain. Sometimes, I'll have a melodic idea but the lyrics are wrong or I'll have the lyrics but can't seem to find the tune that fits so it can be time consuming. I'll work on a song over a few sessions at the piano and then I'll play it to Ben who offers a new perspective. But when we're both happy with how the song sounds acoustically, Ben gets to work recording and producing to create the final result, which can take anywhere between a day and a few weeks to complete. Sometimes the end result is a fair way away from where we started: that's the beauty of collaborating in this way." Anita spoke about two of the songs on the 'Journeys' album. "The song 'Listen' was one of the first songs we wrote as Salt Of The Sound. It stems from a reality of the noise that surrounds our lives - everywhere we go - it is so hard to find times of quiet. It also comes from a realisation that sometimes we are so busy talking to God, we have so much to say that we don't take a step back to listen to what he is telling us. 'Give Me A Moment', the last song on the album, is a reprise of the opening track 'Free'. 'Give Me A Moment' was actually written first, but we felt the lyrics needed to be underpinned by a slower and more reflective musical backdrop as an introduction to the album, so that the meaning could be fully understood: 'Give me a moment, I'll be content/I've been watching and waiting, I come wide open/You give me joy, you give me freedom, You give me hope, you give me reason/You give me strength in every season, You set me free.' These two songs frame the structure of the album: it is our hope and prayer that they help listeners enter in to a place of peace and reflection upon hearing the music. They are certainly vital sentiments for us as Christian musicians." Ben is hopeful as to what the release of 'Journeys' might achieve. "Everyone responds to music in different ways, but it is our hope and prayer that the album helps foster a spirit of reflection. From a Christian perspective this may be through prayer or taking time to listen to God's will. We're also aware that a lot of non-Christians listen to our music through Soundcloud and other online social networks - it is wonderful to think that our music might reach these people with a Christian message in a way that is meaningful in their lives, perhaps even breaking down existing preconceptions." Salt of The Sound really is cutting edge CC music. People are looking for the next big thing and we have found one of the bands of the future if they tough it out. If you believe in something you buy into it.If everyone did their part then we would have more bands like Salt of The Sound. Isn't that what we all want? Something different than what the major labels are offering? Then support bands like Ben and Anita.